Kaznachei’s Pain by V.F. Mason is Available Now…. She changed everything. And demanded it all. 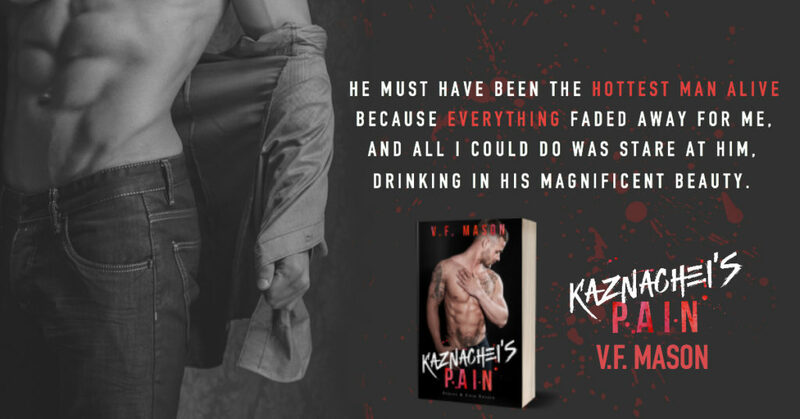 Kaznachei’s Pain by V.F. Mason is available NOW! KaznacheiA long time ago, life was nothing but never-ending suffering. The brotherhood welcomed me with open arms, giving me a chance even though I hated everything about it. For years I lived on the edge of desperation, seeking solace in things that never gave me peace. Until she showed up, changing everything…and demanding it all. A beautiful yet stubborn FBI agent who made me crazy with every breath she took. Unfortunately, her presence awakened the evils of my past that would not rest until they destroyed what I held dear to my heart. V.F.Mason always loved reading books and had quite a few fights with her momma over the genre she liked (romance, duh!) She studied filmmaking and thought that would feed her desire for stories, but that didn’t happen. Finally, when she was tired of all those voices in her head, she sat down and wrote a book. It was a huge decision to make and she thanks her friends and family for supporting her in it. When she is not writing, she can be found with her friends doing all sorts of crazy things or reading recent romance books that were written by her favorite authors. Blog Tour for Faux Pas by Natasha Madison….